In the second circle we find the claws of the God of the Sun, Tonatiuh, shaking the hearts of humanity, the date 4-Tremor which dictates the timeframe where our current race will be terminated, and the four cardinal points or four directions of the universe. “To the sides of the great face appear his hands armed with claws like that of the Eagle, shaking the hearts of humanity. In transcendental esotericism, we the M.M. very well know the significance of a greeting with a claw”. The eye is once again displayed, in remembrance that to destroy our human passions, it is indispensable and necessary to exercise psychological self-observation at every moment, at every instant, with the intention manifesting self-discovery and the knowing of our own selves. It is not possible to eliminate that which we do not know exists. Three circles at the base of the claw show the need to work with the three factors of the revolution of the consciousness: to be Born (transmuting the creative energies), to Die at every instant (disintegration of animal passions) and to Sacrifice for Humanity (to help our fellow men without the expectation of anything in return). There are five adornments with eagle feathers. The number 5 in kabala represents learnings, the Law. It is not possible to dedicate ourselves to the destruction of the “I” without being a “good housekeeper”. It is crucial to live in balance: to be a good citizen, a good parent, a good son, etc., to meet and carry our duties. It is only through that balance where it is possible to maintain our work in righteousness. He who complies with all laws, he who unites his Will with the Law, is the one who really searches for his union with that which is eternal and divine. “The sagacity and the ferociousness of the tiger are truly necessary to annihilate the human personality and drive the resplendence in man of the Dragon of Wisdom of Seven Serpents, the symbol of the decapitated one”. 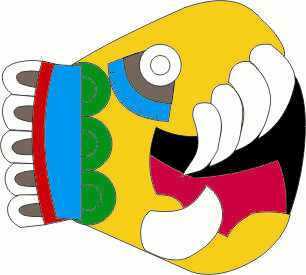 “The feline claws of Quetzalcoatl, our Intimate, prey on the human heart to liberate us from the four bodies of sin and to take us to the ineffable union with God. The spear of Longibus pierces the human heart and it bleeds painfully on repentance. The most sacred sanctity is required for a man to recover his lost inheritance”. “Quetzalcoatl is the internal god of the Aztecs. His feline claws dig deep into the initiates heart to devour it. The neophyte receives his cross of initiation in his heart (the temple of sentiments). Cosmic realizations are reached through the path of the heart, not through the path of intellect”.